If you don't want to expose your pets to the harsh chemicals in many commercial flea shampoos, try making your own organic flea shampoo. Many ingredients are natural flea repellents that will also improve your pet's skin and coat. Making your own organic shampoo is simple; it just takes a few more ingredients and a little more time. You can find organic soapwort root at your local health food store. Bring the water to a boil and add the soapwort root. Remove from heat and cool for 40-60 minutes. Strain the soapwort out of the liquid. Before using this shampoo on your pets, you will need to remix the ingredients again as the oil will rise to the top. This shampoo may not have the best scent, but fleas hate it. It helps get the job done without the use of chemicals. Mix all ingredients thoroughly with a whisk. Shake well just before using. Store at room temperature up to a week. An Internet search for homemade flea shampoo recipes results in many options that use essential oils. In fact, many essential oils repel fleas. However, they may be toxic to cats and even small to medium sized dogs or dogs with sensitive skin. Never use essential oils undiluted on any animal and do not use them on cats, kittens, puppies or toy and small breed dogs (diluted or undiluted) unless under the advice of your veterinarian. Since many factors can affect your pet's reaction to essential oils (such as overall health and age), it's best to check with your veterinarian before using essential oils on even medium and large healthy dogs. Always rinse thoroughly to avoid skin irritation. Use a flea comb. If your pet already has fleas, use a flea comb while he is lathered up to pull the fleas and the eggs away from the skin. Avoid the face. Most animals do not like their faces getting wet. Instead, lather up your hands and gently wash over the face. Remember to get the hard-to-reach areas. Don't forget about washing in between your pets' toes, their tails and their "armpits." While these remedies will help keep your pet flea-free, you may need to reapply or wash with them once a week on an ongoing basis. 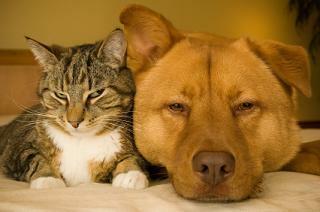 Frequent applications will help ensure your pet is comfortable and not bothered by fleas or harsh chemicals.